Building Innovation 2019: The Institute’s Seventh Annual Conference and Expo brings together the entire building community to take part in sharing ideas, learning from industry leaders and playing an active role in creating solutions for the built environment. All those who plan, design, procure, construct, use, operate, maintain and retire physical facilities contribute to and benefit from attending this collaborative event. Scheduled for January 7-10, 2019, in Washington, D.C., Building Innovation 2019 will explore strategies that are aimed at Optimizing for Tomorrow. Join architects, engineers and contractors; academia; BIM/CAD specialists; building enclosure designers; product manufacturers; software developers and engineers; facility maintenance professionals; researchers; consultants; planners; local, state and federal agencies; building owners and operators; code officials; codes and standards organizations; and more at the only industry event that unites efforts, experiences, viewpoints and ideas on a better built environment. 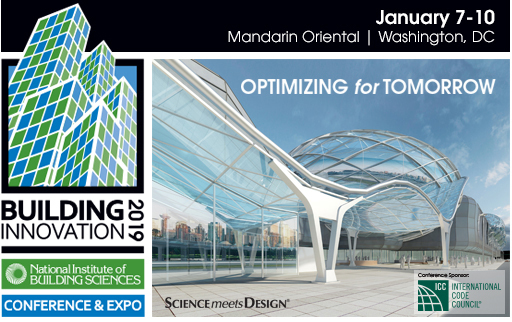 Plan to be there where Science meets Design™ for a compelling program; hear about creative solutions; see some of the latest advancements in innovative products, tools and techniques; witness achievements during an industry award ceremony and presentations; and get an early start on earning valuable continuing education units from both the American Institute of Architects and the International Code Council. Registration for Building Innovation 2019 opens on September 1. Register before early-bird rates end on October 31 and save up to $250 off onsite rates. Find out more and sign up for updates. 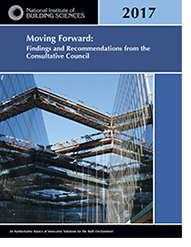 For a number of years, the Institute's Consultative Council in its annual Moving Forward Report of industry priorities has highlighted the importance of advancing the nation’s workforce through technical training and education. On July 31, President Donald Trump signed into law the Strengthening Career and Technical Education for the 21st Century Act (P.L. 115-224). The legislation, which amends the Carl D. Perkins Career and Technical Education Act of 2006, helps more Americans enter the workforce by providing federal support to state and local career and technical education (CTE) programs. The law provides $1.3 billion annually for CTE programs across the country. Read the legislation. Read the 2017 Moving Forward Report. Committees of the Institute's Building Seismic Safety Council (BSSC), under the sponsorship of the Federal Emergency Management Agency (FEMA), convened in Burlingame, California, August 14–16 to continue their work on the 10th edition of the National Earthquake Hazards Reduction Program (NEHRP) Recommended Seismic Provisions for New Buildings and Other Structures. The NEHRP Provisions is a knowledge-based state-of-the-art seismic code resource document compiled regularly to update the nation’s model building codes and standards. On the first day, the BSSC Project 17 Committee, which is developing rules for the new seismic design maps for the 2020 Provisions, met to finalize a ballot on Seismic Design Categories; set the direction for the development of deterministic caps used in seismic design; and receive an update from the U.S. Geological Survey on the 2018 National Seismic Hazard Model. The Provisions Update Committee (PUC), which develops, ballots and reviews proposals for the NEHRP Provisions, met over the next two days to review proponent evaluations of comments on 11 ballots that recently passed in the fourth Committee ballot held in this five-year cycle. The PUC recommended six of the ballots, along with two previously approved ballots, go forward to the BSSC Board of Direction for inclusion in the first Member Organization ballot. In addition, the chairs of the nine PUC Issue Teams presented their progress reports. Learn more about the BSSC’s work. The Federal Emergency Management Agency (FEMA) will host a webinar Thursday, September 6, from 12:00 pm - 1:30 pm PST, to provide an overview of its recently released guidebook, Safer, Stronger, Smarter: A Guide to Improving School Natural Hazard Safety (FEMA P-100). In many parts of the United States and the world, school buildings are highly vulnerable to damage, collapse or destruction in an earthquake, flood, hurricane, tornado or other natural hazard event. The guide aims to equip school safety advocates and stakeholders with the information, tools and resources they need to promote safer schools in their communities by empowering and supporting decision makers with actionable advice. Lori Peek, Director of the Natural Hazards Center and Professor in the Department of Sociology at the University of Colorado Boulder, who served on the committee that developed the guide, will present the webinar, which is geared toward K-12 school administrators, school emergency managers, school facilities managers, school board members, teachers, parent groups and others interested in improving school natural hazard safety. Engineers and building professionals who are interested in communicating the importance of school natural hazard safety to decision makers may also find this webinar useful. Sign up to attend. The Federal Emergency Management Agency (FEMA) is sponsoring a four-day course, E0312 Fundamentals of Building Science, to be held September 24-27 at the Emergency Management Institute (EMI) National Emergency Training Center (NETC) in Emmitsburg, Maryland. The course will present information on the risks posed by natural hazards, and the basic scientific and engineering concepts for hazard-resistant buildings and facilities. The speakers will review information pertaining to impacts of wind, flood, earthquake and wildland/urban interface fire on the constructed environment and explain key performance and construction issues related to floods, wind, wildfires and earthquakes. To apply, participants must complete FEMA Form 119-25-1, with the participant signature and signature of their supervisor or sponsoring agency official. Email to netcadmissions@fema.dhs.gov or fax the application to: (301) 447-1658. To view course details, search for E0312 in the FEMA Course Catalog. National Institute of Building Sciences Board Member Ann Ellis and Institute Vice President Ryan Colker will present at the Infrastructure Imperative Conference, to be held November 13-15, in Cleveland, Ohio. The event serves to foster innovative thinking and idea exchange around designing and building resilient infrastructure in the 21st century. The nature of infrastructure construction is changing, with evolving partnerships, new funding models and rapidly developing technology. During her presentation, “Overview of How to Streamline Infrastructure Projects,” November 14, Ellis will discuss how public agencies, engineering and construction firms can work together to set appropriate standards today that will endure in the long term. The ability of a community to withstand and bounce back after a hazard event is dependent on the investments made in design, construction and operations under “normal” conditions and how the community addresses its risks and vulnerabilities. During his presentation, “Community Resilience and the Role of Infrastructure,” November 15, Colker will explore the path forward for delivery and operation of resilient infrastructure. Learn more about the Infrastructure Imperative. Operations and maintenance (O&M) expenses can account for as much as 80 percent of a building’s life-cycle costs. Yet, working with facility professionals during the design phase of the project can alleviate these costs and help optimize building performance. The Facility Maintenance and Operations Committee (FMOC) will host a one-hour webinar, “Design for Maintainability: The Importance of Operations and Maintenance Considerations during the Design Phase of Construction Projects,” on Friday, September 14, from 12:00 to 1:00 pm ET to highlight the benefits of getting early O&M input. Darrell Rounds, FMA, CEM, the immediate past chair of the FMOC and a current member of the Institute’s Board of Directors, will conduct the webinar. He will discuss how “Design for Maintainability,” a methodology that links O&M goals to the design process, can be applied to any organization. Read the release. Sign up to attend the webinar. The U.S. Department of Energy (DOE) has released the Solar Decathlon 2019–2020 Competition Guide. The guide provides detailed information on competition rules and how to apply. The Solar Decathlon is a collegiate competition that challenges student teams to either design or design and build high-performance, energy-efficient buildings. The winners of the competition are the teams that best blend design excellence and smart energy use with innovation, market potential and building efficiency. The 2019–2020 competition will offer two tracks that build on the strengths of previous DOE student competitions: (1) an annual “Design Challenge” that is the new name for the former Race to Zero Student Design Competition, and (2) a “Build Challenge” that expands on the original Solar Decathlon. Teams in both tracks will present their projects at a single expert-juried event in April 2019. The expert jury will select winners of the Design Challenge and separately approve Build Challenge teams to move on to the construction phase. The Build Challenge teams will then go on to build and showcase their designs at public and industry events in 2020, where final Build Challenge winners will be announced. DOE will host webinars on September 12 and September 13 to go over competition requirements. Learn more about the Solar Decathlon. 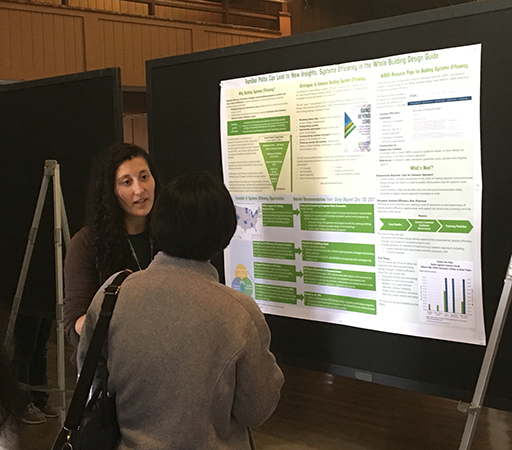 Mikelann Scarbo (left) of the Alliance to Save Energy (ASE) discusses an ASE/National Institute of Building Sciences initiative with an attendee August 14 at the American Council for an Energy Efficient Economy (ACEEE) Summer Study on Energy Efficiency in Buildings in Pacific Grove, California. ASE and the Institute are working to build resources on the WBDG Whole Building Design Guide® to help advance the application of building systems-level approaches to energy efficiency. View the new WBDG Resource Pages.